The 40 per cent proof alcohol sells online for just over $60 CAD, but is currently out of stock. Collagen, a protein which is naturally found in our bodies, is known to give our skin strength and elasticity. It also helps replace dead skin cells. Since we tend to produce less collagen as we age, the beauty industry has created a booming industry out of it. Collagen supplements are one of the latest crazes, but the trend has been around for years in Japan, which has “beauty restaurants” that serve collagen hot pots for anti-aging. Unfortunately, there’s a lack of credible evidence that any of it truly works. 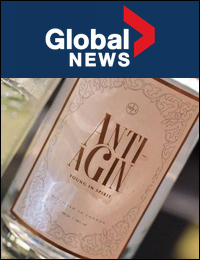 “The claims for ‘anti-aging gin’ fly in the face of scientific research, which has yet to show that drinking collagen can reduce a single wrinkle or have other skin benefits,” said Desiree Stordahl, co-author of The Best Skin of Your Skin Starts Here. She and Toronto dermatologist Dr. Lisa Kellett explain that when you ingest collagen, your digestive system breaks it down. So it doesn’t even reach your skin in the form it needs to be in to be effective. Even face creams with collagen are a waste of your money, experts say, because collagen molecules are so big that they don’t really absorb into the epidermis. Kellett says the best products for anti-aging (aside from sunscreen, of course) are those with Vitamin A (which increases collagen production) and Vitamin C (it has antioxidant properties that decrease the effects of environmental damage). Stordahl adds that cosmetic ingredients such as retinol and epigallocatechin-3-gallate (found in green tea) can also help stimulate collagen production. Perhaps the easiest way to keep your skin looking young, though, is eating a healthy diet that’s low in fat and high in protein and vegetables. “They contain antioxidants and are the building blocks of collagen,” Kellet explained.